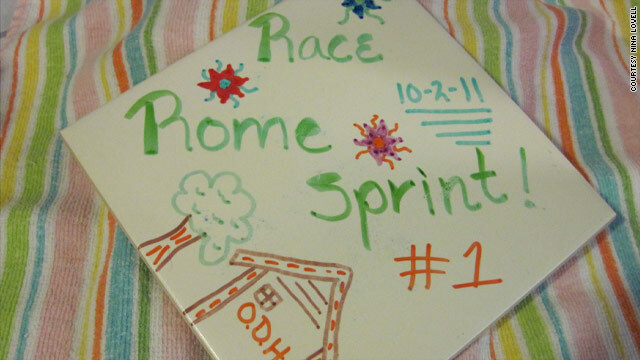 Nina Lovel's first place tile, made a child at the Open Door Home, a beneficiary of the RACE Rome Sprint Triathlon. These two months since the NYC Tri have gone by as quickly as the six that preceded it, because life is well, just so different now. First of all, I have never stopped moving. I did rest for a week following NYC, but soon I was back to swimming, biking and running nearly every day, because I felt so good I did not want to lose any of the fitness I had worked so hard to attain. Also, not only my body, but my APPETITE had become accustomed to that high level of activity, so stopping was never an option. Ten days after returning from NYC, I ran a 5K in my hometown. It was a special anniversary: One year ago, it had been my very first 5K. My time last year was 47 minutes (I walked about half of it), but THIS YEAR I was gunning for a place in my age group! My newfound fascination with race timing led me to analyze last year’s times and calculate what I would need to do to place this year. And I actually beat that calculated time, but alas, my prize was not to be. Although I improved my time significantly (36:16), there were a couple of new and faster runners this year, so I just made fourth, but no worries: I knew that I had left nothing out on the course. Next up: 48 miles on my bike on September 17. This was a beautiful backroads ride, but it was very hilly, and I’m not gonna lie: It wore me out! But I finished it, and enjoyed the after-party, sponsored by the local brewery. The ride was also good training for my next event, which was a sprint triathlon on October 2. My second tri: DONE, and this time, I did win my age group! A hollow victory, perhaps (since I was the only one in my age group), but I finished respectably (2:05), and had some splits just a few minutes longer than participants half my age, so I consider it a victory nonetheless. My next event is the Susan Komen 5K on Saturday in Birmingham. This one will be special because my daughter and 3-year-old granddaughter will do it with me! They will do the 1-mile walk; I will run the 5K. Yes, I paid extra for the timing chip and I’m going to run, because well, I just have to run; it’s in me now. And there’s that thing about setting new PR’s [personal records] that I can’t seem to get out of my head. My MOST exciting activities since NYC, however, do not involve swimming, biking, running, or even sweating: I am on the speaking circuit! I have had several speaking engagements where I get to share my whole story, and there are more on my calendar. Not only do I enjoy telling my FitNation Challenge story (because I get to re-live the fun every time I do); I am actually fulfilling the mission that I established in the video I first sent to CNN to enter the contest. By telling my story far and wide, I am encouraging and inspiring others to get off their soft cushions, get moving, and get healthy. I look forward to spinning my story far into the future, because it's working: I have actually seen people change their own lives as a result of our success in the Fit Nation Triathlon Challenge. One friend who started running several months ago has lost 30 pounds and is looking great. I am just now coming to understand the impact that our 2011 6-Pack Adventure has had, not only to us and our families and friends, but to so many others whom we will never meet. What an honor, what a responsibility…and what fun! Next entry »What the Yuck: Just food poisoning?